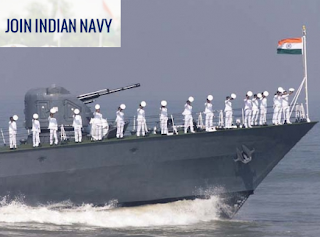 Applications are invited from unmarried male candidates (meeting the nationality criteria set by the Indian government) to join the prestigious Indian Naval Academy, Ezhimala (Kerala), for a four-year degree program (B.Tech) under the 10 + 2 program. Education Qualification: Have passed the senior high school exam (10 + 2 model) or the equivalent examinations of any board with at least 70% overall marks in physics, chemistry and mathematics (PCM) and at least 50% in English (X classes or XII). Candidates who participated in the JEE Exam (Main) -2018 (for B.E./B.Tech). Calls for applications for the Service Selection Committee (SSB) will be issued on the basis of the JEE (Main) - 2018 All India ranking. Selection Process: cut off for short listing of applications for SSB based on JEE (Main) All India Rank- 2018. Based on the cut-off candidates are called for the interview and the successful candidates have to undergo a medical examination. Applicants must register and complete the applications on the recruitment website www.joinindiannaw.gov.in starting from November 3 to 22, 2018. Keep all documents in hand: (preferably in the original) Proof of date of birth, 10th slip, 12th, JEE (Main) -2018 scorecard, signature and a recent passport-size color photograph to be scanned and downloaded in readable PDF format. The details are to be filled as per the matriculation certificate / 12th certificate. Fields such as e-mail address, mobile phone number are required fields.